Social media can be a sticky ground when voicing opinions. Chances of getting bullied and judged by unknown people are tremendous. Harmless comments can get blown out of proportion too. People with or without any agenda target others. Likewise, messages not meant to target anyone are also bashed as being offensive. People love hopping into bandwagons on social media to feel accepted and be a part of the crowd. We are all sensitive people, but only when it comes to our feelings. We do not think twice before judging another and saying a nasty word, even to someone who could be a total stranger. Why is it difficult to restrain our thoughts and views? Must we always voice our views, that too in a harsh manner? In all the drama that we create daily, either online or offline, we seem to lose focus on the one thing that is very vital to a happy existence: Live and let live. Compassion comes naturally to a human being. You may or may not choose to respond to the call of compassion, but you cannot deny the feeling. Why is it then we become judgmental and put a person down? If you don't have a kind word, choose to remain silent rather than speaking a harsh word. I'm not saying the entire world is bad. We have innumerable acts of compassion all around us, but these get drowned in the negativity that somehow gets an unfair spotlight. We still have one neighbour who'll babysit our toddler while we attend to a family exigency, we still have one friend who'll hear you out patiently while you rattle out your fears for the umpteenth time, we still come across honest auto drivers (yes, they exist! ), we still hear how about a lost wallet was returned to the owner through incredible ways over the internet. So, then, shouldn't we be propagating more kindness and compassion rather than fanning anger, hatred and misery? I've, in fact, come across some lovely bunch of people, online and offline, who lend a ready shoulder to lean on, a willing ear to listen and support without being judgmental. Sharing your innermost fears and insecurities becomes so much easier when you know that you won't be judged for how you think and behave. It doesn't cost a thing to nod your head and smile empathically at the one who's brave enough to bare her soul to you. Is it too difficult to say, "I understand. All will be ok"? Can we be more compassionate towards fellow beings? You might not know, but perhaps the other person's life could even depend on how you respond. 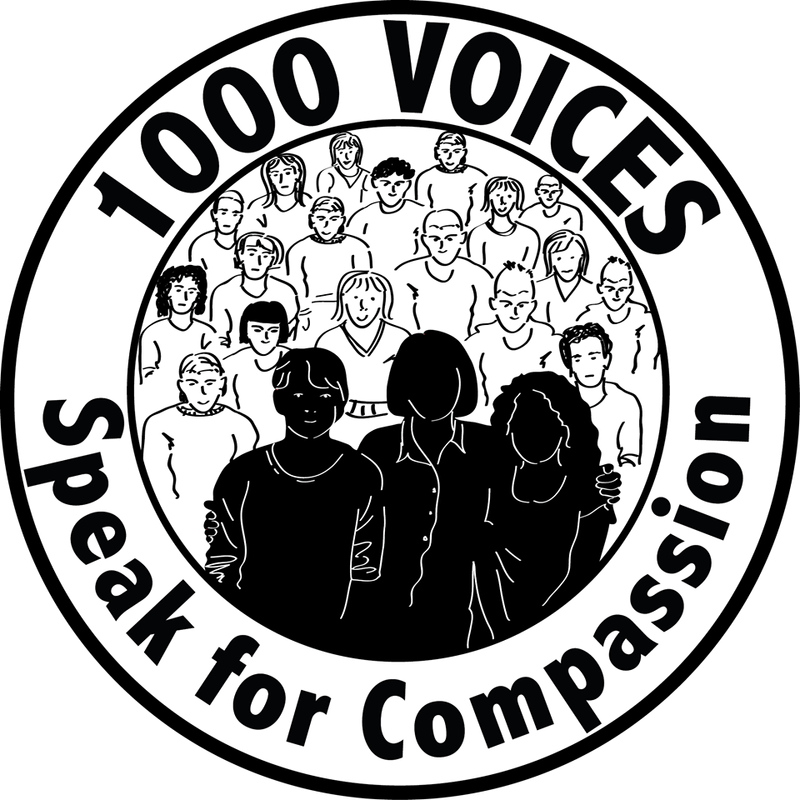 This post is written as a part of 1000 Voices Speak for Compassion, where bloggers all over the world are talking about spreading compassion, love and kindness. I'm glad to have linked up too! The sad part is when harsh words are spoken without much provocation. It is very difficult to see the good, but that should be the way forward! The negativity, cynicism, abuse and intolerance on social media is rampant. I wonder if these people are so rude in real life too. I think it is the cloak of anonymity and/or the idea of fitting in that must be the reason. But yes, there are good people too and I am glad that to meet so many of them! I'm also thankful to have met wonderful people on social media, so I really cannot blame the platform. Yet, the negativity and rude responses sometimes shock me beyond belief. True, Bikram. Just a pause to think how would it be if you were in the other person's shoes will go a long way, isn't it? Reminds me how rude I am sometimes, to my own family. Stepping back a bit and relaxing would make us more compassionate persons. Thank you for writing this, Uma. I think people whoever do not have the guts to say things to other people on their face go viral online. Just press the delete button and move on. Me too, Latha..I say things that I so regret later on. Need to practice more compassion. So true about pressing the delete button and not obsessing over the details. Sometimes the kind of comments I notice on social media makes me wonder as to why such people even exist. But as Shailaja said, we must restrain ourselves and not stoop to their level . Collective consciousness is powerful so when we focus on the negative we give it power. To be compassionate we need to let go of the "I" which is not an easy thing to do. True, Suzy. Collective consciousness has great power. We must all resolve to promote and dwell only on the good that we encounter. This way, we might be able to give impetus to the wheels of compassion. If only we can remember to step back from all the meaningless drama of the lives we experience and witness around us - in real or virtual world, we can so naturally develop a greater feeling of understanding and compassion toward others. Nice post, Uma! Too much drama, no? And, we place so much importance on the "I" in all the drama! Thanks, Beloo!